Offering options from 1 to 8 bit TTL utlizing either solder pins or a multi-pin connector for control. Options including narrowband optimized performance, video filtering and sub-assembly integration. Operating frequency ranges span from 250 MHz to 20 GHz in up to 4:1 bandwidths. Frequency Ranges: From 250 MHz to 20 GHz, any optimized bandwidth is available. TTL Compatible Logic: Logic ‘1’ / BIT = Attenuation Value and all Logic ‘0’ = Insertion Loss. Attenuator without TTL driver is +1 VDC @ 60 mA = Attenuation Value and all 1 VDC @ -60 mA = Insertion Loss. For additional options, please consult the factory. High Speed Switching: Attenuators listed are measured from 50% TTL to 10% / 90% RF from any set value to any set value. Faster switching speeds are available upon request. 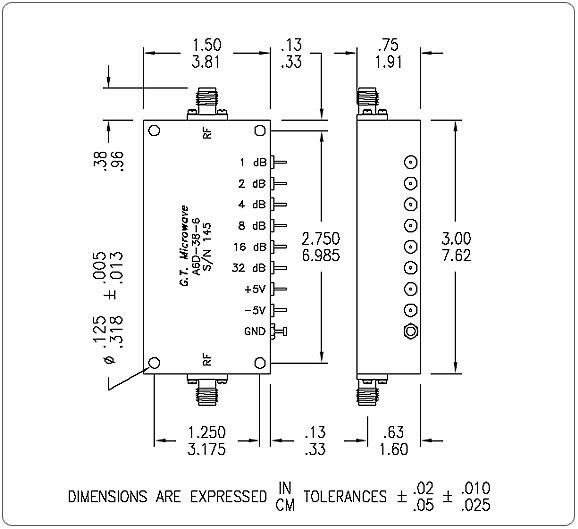 Low DC Power Consumption: Attenuators with TTL drivers require ±5 VDC @ +50 mA / BIT. Stable Attenuation: Variation vs. temperature listed is from -55° to +85° C.